We’d love your help. Let us know what’s wrong with this preview of Truth We Bare by Danielle Rose. To ask other readers questions about Truth We Bare, please sign up. I was happily surprised that this book was in James’s POV. The story gave way more insight into James passed. We also got to see James’s feelings for Jezebel as well as his guilt for what happened in Lies We Keep. I really enjoyed this book! 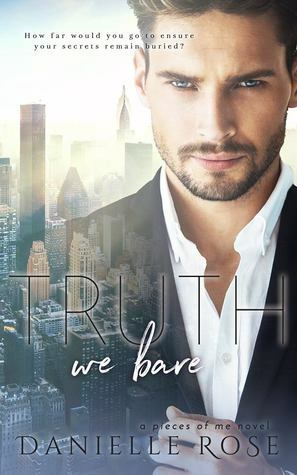 The Truth We Bare is book 2 in The Pieces of Me series. It picks up 12 months later.. Mr. James Blakely is Jezebel Tate's bodyguard.. hired to protect her from the stalker that was after her. Little did he know that the past of his childhood would haunt him years later... James must confront his past in order to live in the present days.. before it claims him forever. I found this book to be exciting.. loved every page... The romance between James and Jezebel is beautiful beyond all means.. full o The Truth We Bare is book 2 in The Pieces of Me series. It picks up 12 months later.. Mr. James Blakely is Jezebel Tate's bodyguard.. hired to protect her from the stalker that was after her. I expected nothing less, but Danielle Rose has done it again. I love that this story is told from James' point of view. There is so much more insight into some of the questions that were left over from Lies We Keep. I love the suspense of the mystery of James and his back story that inter-mingles with the steamy, swoon worthy story between James and Jezabel. This is a fantastic novel, and I couldn't be happier with my reading experience. This is so worth the read, don't miss out on this!! Now that Jezebel is recovering from her ordeal, James' past is coming back to haunt them both. Only problem is, Jezebel doesn't know everything about James' past. Now that Abi is hell bent on marrying James, someone she was supposed to marry when they were kids. You really see the struggles that both Jezebel and James have to go through to keep their relationship working. But will it be too late when Abi makes her appearance in person? Truth We Bare is book 2 in the Pieces of Me series, it can be read as a stand alone but you get to know more about James and Jezebel in book 1. In this novel we get James’ story. The transitions from now and then are smooth. We get pieces of his past as we piece together what happened and why. The chemistry between Jezebel and James is as hot as ever and the suspense is there. I enjoyed every page. In this book James’ past is revealed and we learn what it was like for him growing up in Living Light. We also learn what happened to his family and others in the community. He is trying to overcome his dark past when someone from that past shows up and threatens to take away the happiness he has found with Jezebel. Jezabel and James story continue from James point of view. Very well written with James past coming back to haunt him. Chapters of flashbacks intertwined with the current day tells the story of James. Very well written. Wonderful characters. Heartbreaking moments. Loved Truth We Bear. From the very first page I found this book to be a very enjoyable read with the good storyline and the interesting characters that kept me turning each page until the very end! I was just as impressed with this book as I was the first. The story of James and Jezebel continues, except this book is more about his life and what happened to him and his parents when he was little. But little does he know what dangers are still out there from his past that are still watching him and waiting for the right moment to appear to him. He has a lot of demons to deal with and with Jezebel by his side he can face anything. Even though this is marketed as a stand alone, it is a Duet and I think you would benefit from having book 1 first. That said, it was amazing! Suspenseful, exciting, and steamy. A great read. Truth We Bear was the second in the Pieces of Me series. I really enjoyed both books but may have liked this one a little bit better than the first. It was always evident that James Blakely had been through some difficult times. In this book, we find out exactly what he lived through as a child. The fact that he hides it from Jezebel almost destroys their relationship. Let me say that I really appreciated that in this duet we are able to get a POV from Jezebel in the first book, Lies We Keep and Truth We Bear was the second in the Pieces of Me series. I really enjoyed both books but may have liked this one a little bit better than the first. It was always evident that James Blakely had been through some difficult times. In this book, we find out exactly what he lived through as a child. The fact that he hides it from Jezebel almost destroys their relationship. Let me say that I really appreciated that in this duet we are able to get a POV from Jezebel in the first book, Lies We Keep and from James in this book. Both books had original plot lines that were woven together with the two main characters. It was nicely done. Dubbed a "triple threat" by readers, Danielle Rose dabbles in many genres, including romance, fantasy, and suspense. The USA Today bestselling author holds a Master of Fine Arts in creative writing from the University of Southern Maine. For more information about Danielle Rose, visit her website: www.droseauthor.com.